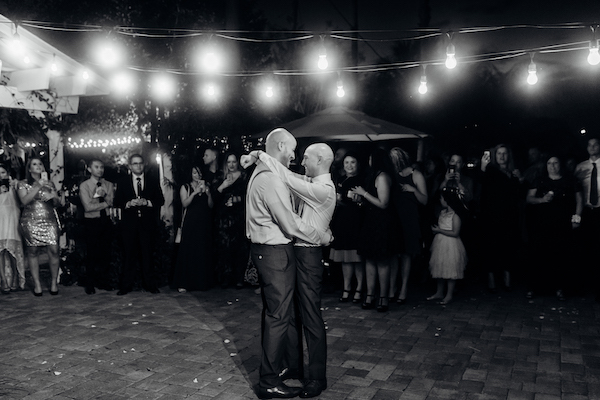 Celebration Gardens recently played host to the wedding of Alexis and Ryan, two incredible guys who were both smiling ear to ear their entire wedding day. 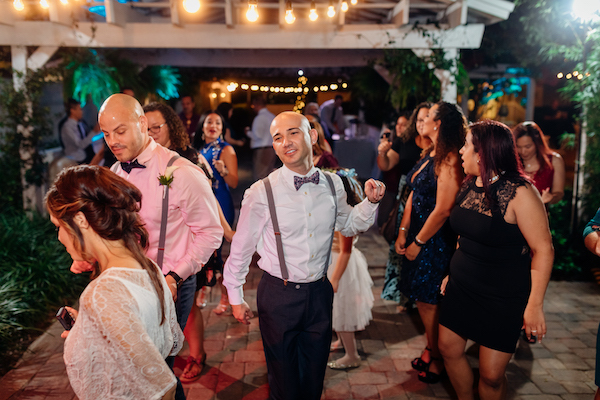 They selected a Celebrations Garden wedding package that included their DJ, Florist, Wedding Coordinator, Catering, Photography, Photobooth and Market Lights. Making planning for their wedding day as easy as possible. 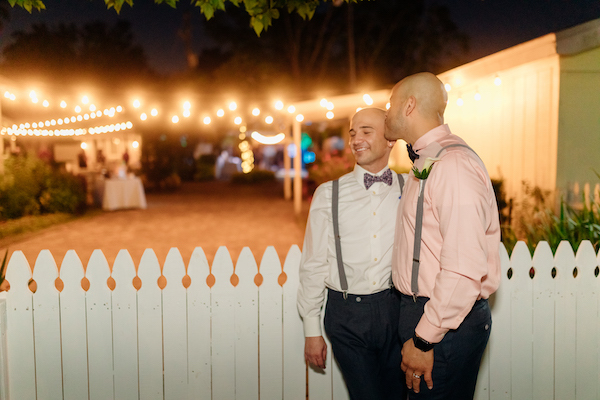 The two grooms opted to spend some time together getting ready in our wedding cottage’s ready room. 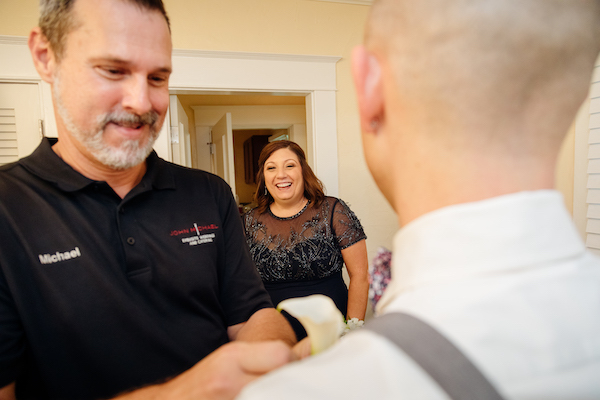 Our Celebrations Gardens facility manager, Michael Thomas checked in on them to make sure everything was going well and to pin on their boutonnieres. 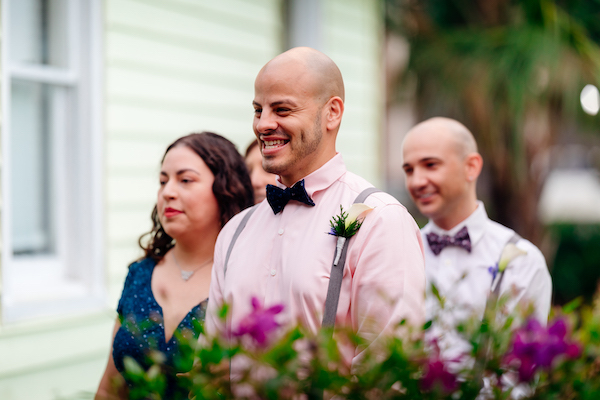 The gardens looked spectacular in a burst of color as the grooms and their wedding party gathered for their wedding ceremony. 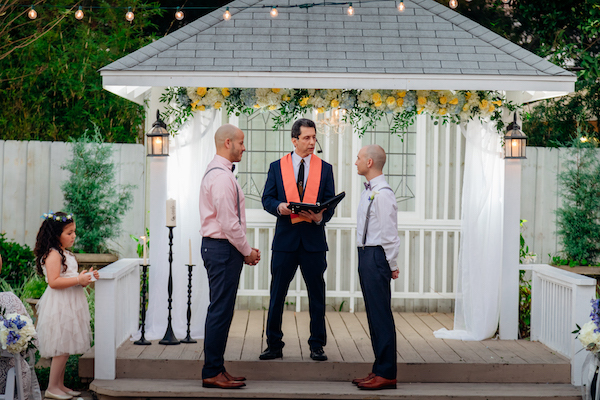 As sunset approached Alexis and Ryan exchanged their wedding vows on the steps of the gazebo under a canopy of yellow and white flowers. About eighty family members and friends, seated under soft market lights witnessed the two exchange their wedding vows. Wedding guests enjoyed a cocktail hour of delicious butler passed hors d’oeuvres. 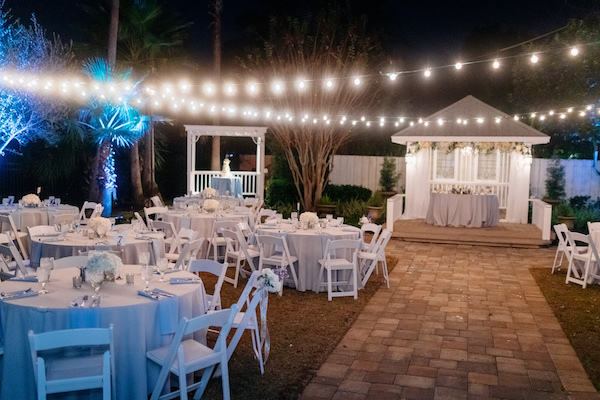 As the Orlando sun set, guests gathered at tables on the lawn draped in white with light blue napkins and white hydrangea centerpieces. 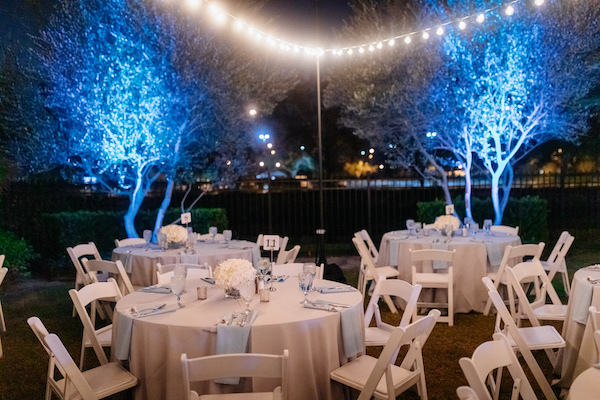 The soft blue up lighting, and overhead market lights set a beautiful backdrop for their wedding reception. 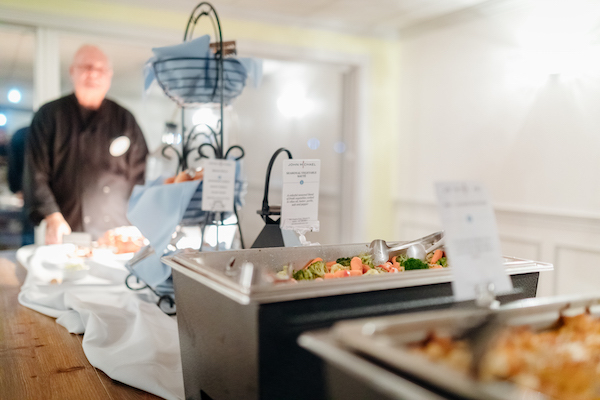 After Alexis and Ryan’s first dance everyone enjoyed a buffet reception by John Michael Exquisite Weddings and Catering that included Chef Carved Pernil, Panko and Parmesan Crusted Chicken and Sundried Tomato and cream Ravioli. 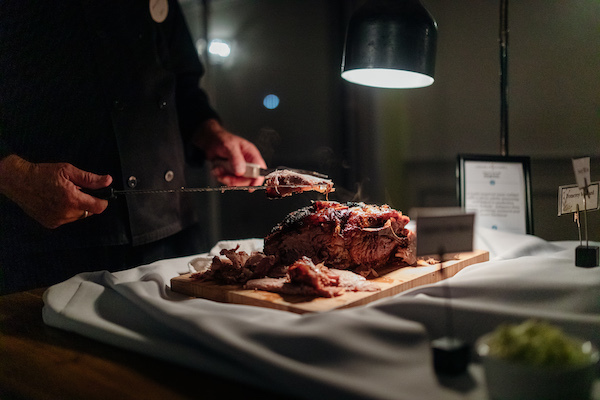 The dinner buffet was placed inside our indoor event space and we took full advantage of the lawn for dining in the gardens. 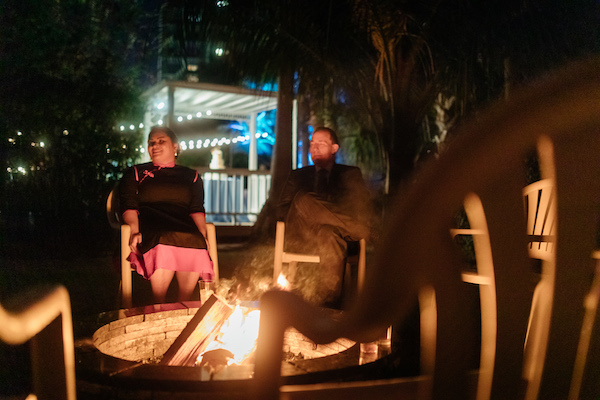 The grooms and guests enjoyed a night of dancing under the stars and relaxing by our firepit. 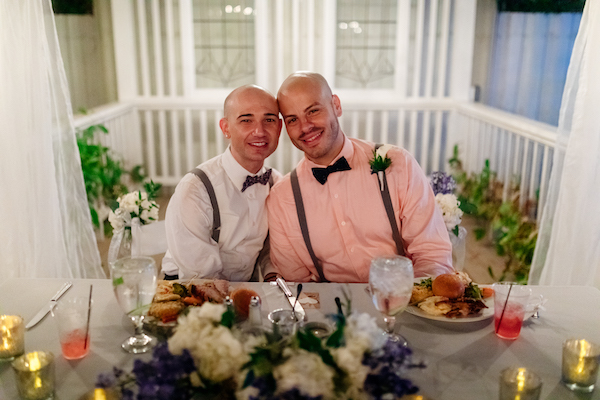 Congratulations Alexis and Ryan, we are glad you both enjoyed your wedding day! 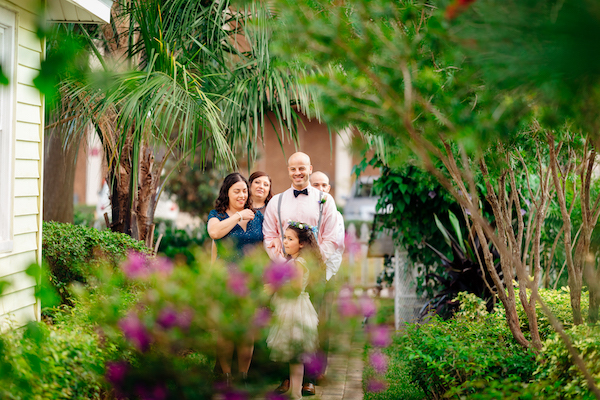 Be sure to contact our Celebration Gardens team for more details on hosting you Orlando wedding in our beautiful garden spaces.